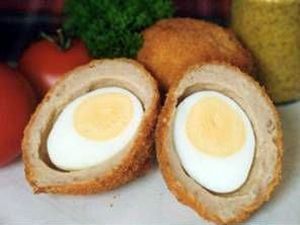 These superb scotch eggs are coated in fine breadcrumbs, with a whole boiled egg inside. An ample portion, suitbale as a snack, or as part of a salad. Why not add one of our homemade chutneys for added flavour? No related products for the Large Scotch Eggs. No key features selected for the Large Scotch Eggs. No quantity discount for the Large Scotch Eggs. Be the first to submit a review for the Large Scotch Eggs.